Home / How to turn on/off a group notification? How to turn on/off a group notification? Sometimes the main purpose when you join a facebook group is to keep in touch with your friends, colleagues, relatives,… It can be a long-term group or a short-term group particularly for only one period. And getting updates from the group has become really important to members, especially business group. You need to turn on the group notification. But how to do it? In this tutorial I will show you how to turn on/off the notification from a group. Step 1: You must be member of the group you want to get notification. If you are not in that group, you need to join it first. Step 2: Enter the group, on the right corner there are some options. Click on Notifications. Step 3: On the list appeared, you can change your notification settings, such as turn on notifications for All Post, Highlights or Friend’s Posts. All Posts: You will get notification whenever there is a post on group. Highlights: You will get notification from several posts that you’ve highlighted. This function is only available in some areas. Friend’s Posts: If the group you joined is a public group or it has a lot of members, you probably can not be friends of all. By choosing this setting, you will get notification only when your friends post, comment on the group (including threads you haven’t commented on). You can also turn the notifications off if you don’t want to be disturbed by spam from the group. You will no longer receive any notification. Another way to turn off notifications is by clicking on the small “x” on the right box when there is a group notification. You will get an asking confirmation to stop receiving notifications from the Group. If you choose to turn off notifications, you will have to visit the group whenever you want to get its updates. 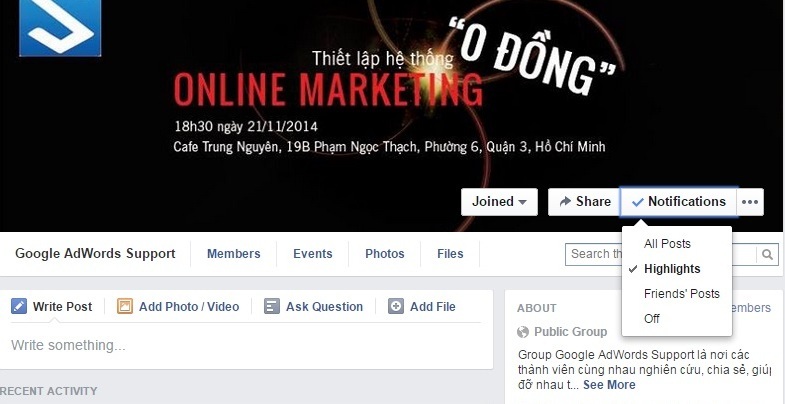 Previous Post: How to join a Facebook group? Next Post: How to add friends to a Facebook group?